James Rodriguez (l.) is hoping to use his impressive performance against Leipzig as a springboard for further success with Bayern Munich. His coach Jupp Heynckes was also enthusing about the Real Madrid loanee. “He’s an imaginative player and also did a lot to help out the team, both in attack and defence. That is exactly what I demand from him,” said the 72-year-old treble-winning coach, but still remaining true to his principles as a football tactician. “I’m a coach who demands even more. We will still be working on things together.” High praise from a man who has won it all, but also a challenge for even more from the 2014 FIFA World Cup Golden Boot winner. James looked at home on his first Bundesliga start at the Allianz Arena and added real impetus to Bayern’s attacking game against the compact defence of ten-man Leipzig. The 26-year-old had more touches of the ball than anyone on the pitch in the first half, and by the end of the game only centre-backs Jerome Boateng and Mats Hummels could boast more. The Colombian was also involved in almost half of the champions’ 24 attempts on goal, becoming Bayern’s biggest attacking threat in the absence of Lewandowski, who was substituted shortly before half-time as a precaution for a possible thigh injury. The 25 challenges James contested was also the most on the pitch, and showed he is truly beginning to adapt to the Bundesliga’s style of football following spells in less physical leagues such as Spain’s La Liga, France’s Ligue 1 and Portugal’s Primeira Liga. It has, of course, not been an easy start to life in Germany for the Colombian. The loanee missed the opening games of the campaign with a muscle injury he sustained in pre-season, and it was not until September that he made his competitive debut for the record German champions. That came as a substitute in the 2-0 loss at Hoffenheim – a game that he was generally unable to affect in just over ten minutes with a below-par Bayern. Things were different on his first Bundesliga start for the Munich club, though, as James shone in a 3-0 win at Schalke on Matchday 5. He was the one who took the game away from the Royal Blues with a sublimely taken goal that deceived the Schalke defence before he provided the second-half assist for substitute Arturo Vidal to wrap up the three points in Gelsenkirchen. After that game, the world felt James had truly arrived in the Bundesliga and would go from strength to strength with Bayern. However, it did not quite work out that way as he remained a bit-part player in Munich. Numerous brief substitute appearances have been interspersed with a couple of starts, but even in those James was subbed off at half-time. The Colombian appeared to be struggling to build on that break-out Bundesliga performance. 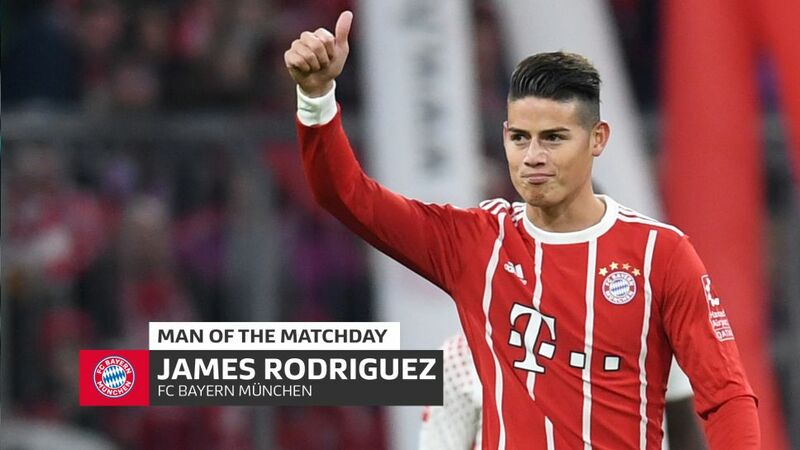 A lack of true match fitness, combined with long journeys to South America to help ensure Colombia’s qualification to the 2018 FIFA World Cup, will not have helped James at the very start of his Bayern career, but he now has a second attempt on the springboard to build on his match-winning performance against Leipzig, and will be especially important for the German champions in the absence of the injured Thomas Müller and Franck Ribery. What about James himself? Speaking to fcb.tv after the game, he said, “I scored a goal that helped us. That gives me great belief going forward.” Confidence, therefore, appears the key for the Colombian, who will now be eager to ensure this is a step forward without having to take any further backwards.